The wool winter coat came out the other day and along with it, a battered Stormy Kromer, one of those wool caps that looks like it should have been worn by an Upper Peninsula logger in the 19th century or a European immigrant during the same time period. They aren’t exactly what you’d call hip in an urban way, but they have a certain backwoods chic to them, if worn properly. They should be pulled down as far as possible, giving you a Finnish farm boy look. 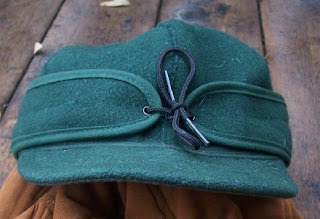 And if it’s cold and windy, pulling the flap down keeps the cap snugly on your head. Only once did my cap blow off and that was on a winter day in Marquette when the winds off of Lake Superior hit about 50 miles an hour, so strong that the power in the downtown area was knocked out. And I did have to scramble for the cap, which was being tossed around by the wind. They’re made in Michigan and have an Upper Peninsula heritage. As the story goes, the hat was created in about 1903 when George “Stormy” Kromer, a semi-pro baseball player and railroad engineer kept losing his hat when gusts of wind blew through his locomotive. He asked his wife, Ida, to do some work on one of his ball caps. She came up with the Kromer. During my travels, researching Michigan: An Explorer’s Guide, I stopped in at the Stormy Kromer plant in Ironwood Michigan. It did my heart good to see local people working in the plant in the western Upper Peninsula, where unemployment is high. According to the company, it will produce 65,000 of the caps this year. The firm also makes shirts, gloves, jackets and other items, all made in Michigan. Check out their products at their website, www.stormykromer.com, they’re about the same price as sportswear produced overseas. I had a particular treat this past fall when rambling around the western Upper Peninsula with a friend who was picking up a new vehicle. We went to a large hunting and fishing lodge, a classic north woods log lodge compound and discovered that the folks from Stormy Kromer shot the photos for their hats at the place.